244-248 Great Portland Street, W1. Manufacture and supply of bespoke FSC® certified “Concrete Grey” RAL 7023 spray paint lacquered FD30 fire performance glazed Shadmaster solid laminated timber core doors factory hung in primed hardwood framesets. Chatham House, Greenfields Community Housing, Braintree, Essex. Manufacture and supply of bespoke FSC®certified factory spray paint lacquered (Dulux 70YY46/160) FD30Shadmaster solid laminated timber core doors. Edinburgh Printmakers, Castle Mill Works, Fountainbridge. Manufacture and supply of bespoke FSC®certifiedFormica “Terril” laminated FD30 and FD60 fire performance doors and doorsets; “Pure White” RAL 9010 factory paint lacquered FD30 and FD60 fire performance doors and doorsets were also supplied. Shell Centre Tower, York Road, SE1. Manufacture and supply of bespoke FSC®certified straight grain European oak veneered high performance acoustic and FD30 & FD60 fire doors and doorsets; doors and frames were stain finished to match the architects’ approved pattern. Crystal White Formica laminated doors with factory primed hardwood framesets were also supplied. The Post Building, Museum Street, WC1. Manufacture and supply of bespoke Abet Laminati clad washroom cubicle doors, pilasters and back panels. Manufacture and supply of bespoke FSC®certified stain finished crown cut European oak veneered FD30 & FD60 fire performance doors and doorsets; additional doors and frames featuring a stain and lime finish (to match the architects’ approved pattern) and “Pure White” RAL 9010 factory spray paint lacquered FD30 and FD60 fire performance doors and doorsets were also supplied. 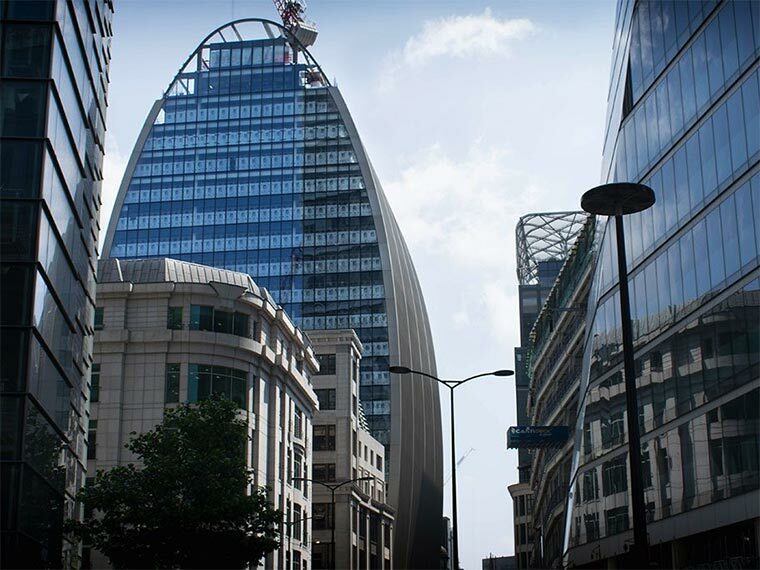 60-70 St Mary Axe, EC3. Manufacture and supply of bespoke FSC® certified “Pure White” RAL 9010 factory spray paint lacquered FD30 and FD60 fire performance glazed doors and framesets featuring overdoors c/w concealed door closer at interface. 1 Fen Court, Fenchurch Avenue, EC3. Manufacture and supply of bespoke FSC®certified “Pure White” RAL 9010 factory spray water-based paint lacquered FD30 fire performance doors and doorsets. Alexandra Palace Exhibition Centre, Muswell Hill, N22. Manufacture and supply of bespoke FSC®certifiedfactory primed FD30 and FD60 fire performance glazed doors and doorsets; period panelled doors were also supplied. Redbrick Estate Community Centre, 163 Old Street, EC1. Manufacture and supply of bespoke FSC®certifiedcrown cut plain birch veneered FD30 and FD60 fire performance doors and factory primed hardwood frames.